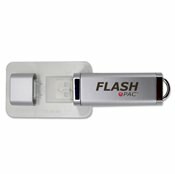 When you want to dress your drive for success, you’ll definitely impress your audience with the Flash Pac® USB case. They are an appropriate option for any environment or context, be it professional, personal, or commercial. They hold a standard size flash drive with cap, outer entrapment, and printed inserts. These packaging options are flexible in capacities; some hold multiple drives or also can be accompanied by a disc. Either way, these custom USB holders offer excellent, professional aesthetic and protective value for your promotional product.